Michigan personal injury lawyers frequently represent clients who have suffered hip injuries, including hip fractures, in all different type of personal injury cases. These include car accidents, slip and fall injuries, and falls in nursing homes. The injuries are severe and often require surgery and lengthy rehabilitation. Many subtypes of fractures about the hip joint are colloquially known as 'hip fractures'. Although a true hip fracture involves the joint, the following four proximal femur fractures are commonly referred to as 'hip fractures'. There are different types of treatment for each type of fracture. A femoral head fracture denotes a fracture involving the femoral head. This is usually the result of high energy trauma and a dislocation of the hip joint often accompanies this fracture. A femoral neck fracture (sometimes neck of femur (NOF), subcapital, or intracapsular fracture) denotes a fracture adjacent to the femoral head in the neck between the head and the greater trochanter. These fractures have a propensity to damage the blood supply to the femoral head, potentially causing avascular necrosis. A intertrochanteric fracture denotes a break in which the fracture line is between the greater and lesser trochanter on the interonchanteric line. 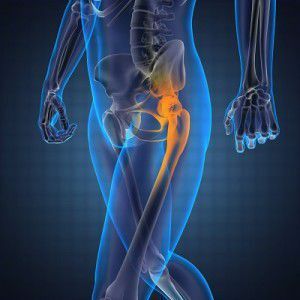 It is the most common type of 'hip fracture' and prognosis for bony healing is generally good if the patient is otherwise healthy. A subtrochanteric fracture actually involves the shaft of the femur immediately below the lesser trochanter and may extend down the shaft of the femur. Often times, the hip fractures are treated with screws and plates and other times a full or partial hip replacement is needed. A hip fracture is ultimately diagnosed by an x-ray, although there are some common complaints during a physical exam that also assist with the diagnosis. The surgery is performed by an orthopedic surgeon. After the surgery, physical rehabilitation and exercise is often prescribed. Medications are also often give to reduce the risk of blood clots. During the rehabilitation period, the patient will often need assistance with toileting, transfers, and other needs. If you or a loved one has suffered a broken or factured hipresulting from a car accident, slip and fall accident, hospital or nursing home fall, or other type of personal injury accident, you may be able to file a lawsuit to recover compensation for your pain and suffering. Our Michigan hip injury attorneys will listen to your story and tell you how we can help you. Call us today at (800) 606-1717 to speak with a lawyer and to start your case today. We charge no legal fees unless you win a settlement and we pay all case costs and expenses. There are absolutely no costs to get started.